As in years past, I wanted to take a moment today to share deep and meaningful (😉) life lessons I learned on the road from 32 to 33. In all honesty, and as silly as it sounds, I really think I “grew up” and got to know myself better this past year. It’s been a year of reflecting and trusting the Lord. Tossing away much of the useless nonsense that consumed my life for far too long. 1. I think that maybe (??) I’ve become more of an introvert in my old age. Still, I’ve was always been fairly quiet and timid (unless I’m among my trusted “tribe"). I’ve noticed over the last couple of years that my preference is for more intimate, less chaotic engagements. So yeah, kind of a big revelation I discovered this past year. Ha! 2. Triscuits are the jam. Go buy a box of the cracked black pepper & olive oil, or the dill ones. Once you buy them you’ve pretty much surrendered to the fact that they have to be in your kitchen cabinet ALWAYS. 3. Social media is overrated. I know this isn’t the consensus, especially for people my age and younger, but seriously- for me, it’s true. I enjoy taking huge breaks from the rat race that is social media (see #1 above). I often use Lent as an opportunity to disconnect, and find my usage continues to say very minimal afterward. It makes me more present and aware of the moment. Of actual life in the flesh. Of all the little moments before my eyes I often miss when I’m buried in my phone. No lie- I can’t tell you how many times I’ve looked up from my phone and can’t remember the last 10 minutes of real life around me. Yes, I completely agree there’s a time and place. There are so many people dear to me that I can connect with through social media when I normally wouldn’t see them except major holidays. I also see the value in social media (um, after all this is a blog post), but I also see so much more value in investing in the life right in front of me. I find I often busy myself with noise. The radio is always on. The TV is always on. I can’t focus and hear the voice of God. When I finally intentionally quiet myself and step away from the craziness of life, it feels wrong sometimes. Because I feel as though something should be done. That I need to be acting or moving or doing. It feels unnatural because we’re constantly faced with stimulation. Yet, when I force myself to declutter my mind and sit in the stillness of God’s word and actually listen, I find Him. I hear His Truth and desires. It takes focus, but He promises He rewards those who earnestly and diligently seek Him. And it’s worth it. 5. Marie Callender’s Cherry Crunch Pie will make you hate yourself. It’s so dang good, and you’re going to loathe loving it so much. 6. I enjoy at-home workouts as much as gym ones. I suppose I always have, however given the choice, I’d always given the edge to the gym. I love the versatility of at-home workouts in the privacy of my own living room. Who cares if I’m sweating like a pig and don’t smell like roses!? 7. Things don’t go as planned. But seriously, I’ve been extremely blessed my entire life and had been shielded from a lot of heartache. The Lord has been doing lots of pruning on my heart in this season of trials, and it hasn’t always been easy or enjoyable. Nonetheless, I can look back on this last year and consider all my plans and see how the Lord has steered our life in such a different direction (see Proverbs 16:9). Not as I planned, yet I can still see His hand in it all and have peace. 8. Clean your shower every week. Seriously. I know you probably hate it as much as I do, but DO IT already. As we both know, the longer we wait, the worse it gets. Mix one cup of vinegar and one tablespoon of blue Dawn dish soap in a spray bottle and soak your shower with it. Let it sit a few hours and then wipe. We want to live in this huge gray area so as not to offend anyone, but the fact of the matter is- you’re always going to offend someone. I firmly believe there’s a way to hold the line without being a jerk, which is what the media seems to portray anytime one “side” disagrees with another. Truth counts, so own it and stand firm in your convictions and dialogue in love, don’t yell and flail in hate. 10. I’ve become a full-blown carnivore again. I still aim for more of a veggie friendly diet, but I’ve also been adding chicken and fish to my diet 1-2 times a week. Plus I pretty much can’t turn down grilled Chick-Fil-A nuggets. They pretty much sent me to the edge, and it didn’t take much more to jump thereafter. Ha! 11. Deep condition your hair. And if it’s super dry like mine, do it every time you wash it. I used to think deep treatments were once a month type things until I started doing them twice a week. Game changer. I’ll never go back now! 12. I have friends who genuinely care. Y’all, I am so thankful for my inner circle of friends. I have been uplifted so many times this year by their love and encouragement. 13. This life isn’t mine to live. This is the biggest lesson. It’s something I’ve known as a Christian in theory, but have finally begun to behold. I’m so done with trying to live my “best life now” with no consideration for standing before Jesus one day. I want to be selfless and give more. Care more. See people more. Act more. Love more. Stand more. Not for me or some meaningless cause, but for Jesus and Truth. Even when it’s unpopular. I’m so done wasting my life and want 33 (and beyond) to be one of surrender and awe. To see what God can do if I’d simply get out of the way. Streams of consciousness from my heart to yours. 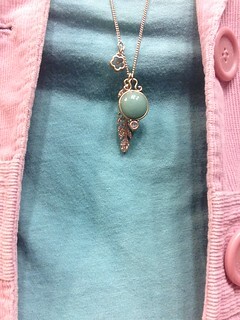 One of my dear friends bought me this beautiful necklace for Christmas. To most, its just a regular necklace. However, to me it’s been a daily reminder of the Lord’s faithfulness. The flower with a teeny tiny dot in the center? It’s a a mustard seed. Yet we’re reminded both in Matthew and Luke that with the faith of a mustard seed, little becomes much when it’s given to the Lord. If you’ve grown up in church you’ve heard the stories. If you haven’t, well now you have a little exposure. The truth is, hearing the stories of “having faith the size of a mustard seed” and actually having faith the size of a mustard seed are two very different things. That I trust Him whole heartedly to move my mountains and use the hurts and trials in my life for the glory of His namesake. Those are good sound bytes that easily roll off the tongue and exude the appearance of deep spirituality. But the truth is, over the last several months, I’ve truly begun to grasp why Jesus uses such a minuscule object to illustrate such a beautiful lesson. 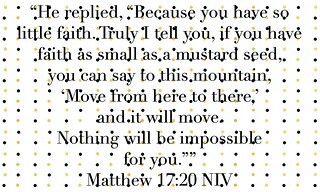 You’d think it’d be easy to have faith the size of a mustard seed, but it can be quite a challenge! When the storms of this life rage around us, when we’re in the thick of it and can’t breathe, when we feel the weightiness of this life bearing down on us, it can be hard to have such “big” mustard seed faith. It can be scary to let go and trust God. It feels like a tall task some days. That’s why I can’t help but know in my heart that’s why Jesus used the mustard seed as an example. Yet God can take the “simple” obedience of our surrender and multiply it infinitely farther than we ever imagined. He’s our infinite God. Nothing is to big for Him! 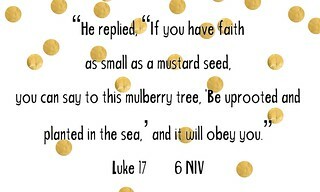 The struggle we feel to have “big” mustard seed faith reminds us how vast He is. It’s not us who “moves the mountains,” it’s Him. It’s not us who “uproots the trees,” it’s Him. In the grand scheme of this entire world, our lives and stories are very small. Yet they never go to waste when we yield ourselves to Him. He is able to take our lives and accomplish glory to His name when we simply put our trust in Him to do what He says. So if you’re struggling to hand over the “big” things over the Jesus, you’re not alone. It can be hard. But may we be reminded all He can accomplish in and through us for His glory if we take a step of faith and let Him do the rest. 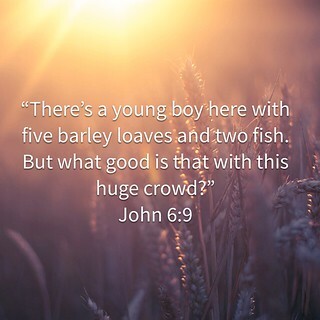 Are we content with five loaves and two fish? We’re “feasting” on crumbs when God wants to multiply, share, and do so very much more in our lives. I watch many of my brothers and sisters who rely heavily on church leaders, and authors, and speakers to guide their spiritual walks. These people are good. Praise God for how they have ministered to my own spiritual walk. They didn’t die for us so that we may live. They didn’t conquer the grave or know us before we were even born. We want the two minute, Cliff’s notes theology when we could truly be knowing, intimately knowing, the King of Kings and Lord of Lords. Are we settling for crumbs, thinking we have plenty? Thinking we have enough? There’s more friends, so much more. If we would place our lives, our hearts, in the hands Jesus we would see just how far these “loaves” can go. He can do infinitely more in our relationship with Him when He’s the center; not a preacher, self-help spiritual book, or anything else. Again, those things are certainly helpful, but they should be in addition to our personal intimate relationship with Jesus, not in place of. Go to the Source, the Well, the Living Water. 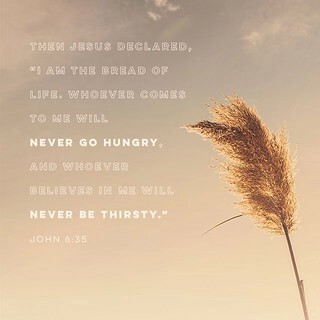 The Bread of Life. He declares himself as such for a reason. How often are we digging deep into scripture? On our face in prayer? Do we know the heart of Jesus for ourselves, or do we rely on others to tell us about Him? Oh friends our God, our great God, wants to do so much more. He wants to take our lives and bring Himself glory. That means knowing Him. Watching Him take the loaves and fish of our lives and do as He pleases. It means no more settling for enough, or being spoon fed by others. It means graduation from spiritual milk to actual meat. To love Him enough to put in the time and effort to seek Him. 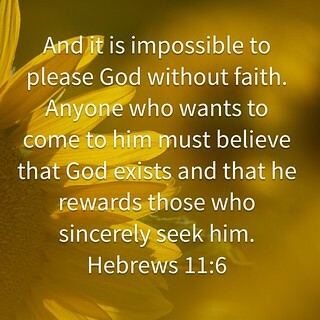 The Bible tells us He rewards those who earnestly and diligently seek Him. Him! When we have forgotten it’s all about HIM, not us? I can only imagine what He might do with a handful of His servants who are yielded that He may multiply their offering for His glory. New Year’s Eve was full of reflection in the B-Love house. As you may remember, 2015 did not go as we anticipated or hoped. We spent the last night of 2015 talking about our expectations for the year and how differently they played out. Who would have thought the bottom would have fallen out of the oil and gas industry, and that selling our half of the business might have been one of the best things that could have happened to us at the time? Yet, before all that came to pass, our initial expectations for 2015 were quite different based on our limited knowledge. As a preacher I know once said- We only have a few pieces of the puzzle, but God has the whole box top and sees how it all goes together. I told Will I was frustrated. I could clearly see God’s hand and protection over us with how things happened with the business. What a huge, huge blessing we can now look back on and see. 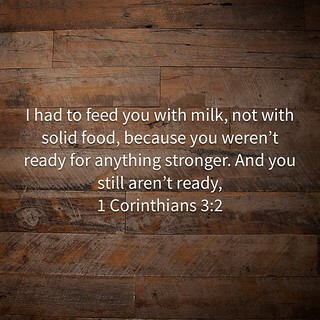 How he made provision to protect us even when, at the time, we thought everything was crumbling around us. Yet, ever since then, I haven’t really been able to detrrmine God’s guidance regarding what’s next. I kept waiting for Him to show up in some mighty way this year. Divinely showing Will that he was supposed to go back into the ministry. Yet, that opportunity came and went this year too (though I didn’t post about it on the blog). I told Will I was frustrated because I’m here. I’ve got my arms stretched out wide asking God, begging God, to use me. To take my life and do as He pleases. To show me where to go. To open doors and give me opportunities to bring Him glory. It’s like we’re in the car ready to drive but have no directions to our destination. “It would be a lot easier if He’d just tell us what to do next!” I told Will. Will is used to my impatience. He looked at me and said what I already knew. The journey is about being refined. We talked about the “Hall of Faith” in Hebrews and how long, how incredibly long, most of the people had to wait for God’s full plan to come to pass. Just like us, they waited. They probably wondered, and perhaps they even wandered and floundered sometimes too. Being refined in His likeness. He often doesn’t do what we expect, but that doesn’t mean He’s not at work. We agreed we likely won’t see the fullness of our 2015 story for quite some time, because it’s a journey. We will simply step out in faith this year and “do the next thing,” trusting that God will redirect if that’s not the right next thing. I’d be lying if I said I wasn’t anxious about 2016. Nervous about the oil and gas market and how it’s affected and is affecting our great state. Nervous about my job in this industry, just as my fellow colleagues are too. 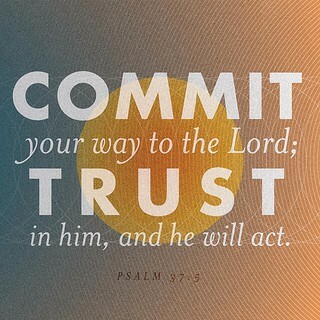 I truly believe I will have to trust in and rely on the Lord more this year than ever before. Remember my post about that? It still rings true. Everyday. I pray this year brings us closer to Him, and that we see His hand in every move we make. I pray this year we will draw closer to Him and let Him do as He pleases, even when we don’t understand. I pray others will be strengthened around us and that God will glorify Himself in all we do. To the journey of 2016. To the glory of the Lord our God. I hope you’ve had a wonderful week full of good things. I’ve had a hard time managing my expectations around how I wanted the week to go and how it’s actually gone. Isn’t it always like that!? We had a wonderful Thanksgiving, with more family attending this year than we’ve had in a long time. Then I looked up, and it was Christmas week. Let the online shopping, baking, Christmas card making, crafting, gatherings, and end of the year work stress commence. I’ve been so wrapped up in the cares of this world that I’ve been distracted from the one and only thing that matters: beholding Jesus. Anticipating his coming as a baby, as well as his future coming for His bride. I pray this week you and I both take a moment to clear the stressful thoughts clouding our minds and simply quiet ourselves before His glory. To be held, and to behold. The baby Jesus, our mighty Lion from the tribe of Judah. Fall finally arrived in all its glory here, and I’m basking in cooler temperatures and all things pumpkin spice. There’s so very much I want to share with you, so I’ve decided to do a two part post. 2. The second (and my favorite!) to give you a big fat life update and share some of the things God is putting on my heart. 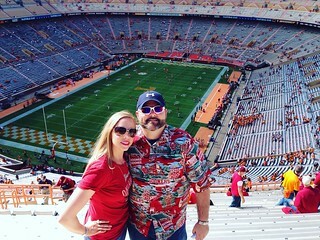 So let’s get moving back with that Tennessee recap! This past Labor Day Will and I hopped on a plane and flew to the beautiful land of rolling hills and the friendliest people you’ll ever meet- Tennessee. In the interest of actually getting this post done and on the blog, here’s a rundown of just the highlights each day. For a travel day, we did well. Usually we’re running around like madmen scrambling to get out the door. This year we had to drop the dogs off on Saturday instead of Monday, so it helped reduce the craziness. Monday was a total travel day. Long and uneventful. Thankfully everything was on time and we got to Nashville late that afternoon. We were tired and kept things low key. We stayed at the Music City Sheraton, so we checked in, hit a Kroger for a few items, and had dinner at chickfila. I also got to sleep tons, y’all! It was great! In fact, I went to sleep close to 8 that night didn’t wake up until 7:30! Our first full day of vacation was wonderful. We had a leisurely morning followed by a scenic drive outside Nashville. We drove a little outside of the city to have brunch at the famous Loveless Cafe. It was so darn fun! It used to be a hotel back in the 60s and was a hidden gem for travelers. Known for their delicious homemade biscuits, they grew in popularity throughout the region. They eventually converted the hotel into little adorable shops and just keep the restaurant open- and it’s always busy! The biscuits and jam pretty much killed me. I also went a little wild at the store. After brunch Will and I headed into Nashville to tour the Opry! I found the backstage tour very interesting. I didn’t know much about the Opry before, so I learned heaps about the history. We got our picture on the stage and our tour group even got to sing a song front and center. We went to the mall across the street between the tour and the evening show. We had a quick bite at Moe’s and headed to see the show! We were lucky enough to have a great show the night we went. I also had no idea it was a live radio show! Interesting. Although I slept late again, I managed to get in a workout Wednesday morning. We got a late start and after getting ready headed downtown to the Ryman. Much like the Opry, I didn’t know a whole lot about the history of the Ryman. I found its origins very interesting and enjoyed hearing how they’ve grown over the years and are still going strong. Like the Opry, we were able to go backstage, onstage, take lots of pictures. If you’re traveling to Nashville and are torn between only wanting to do only one tour I’d definitely say to the Opry. I liked the Ryman, but the Opry was better. 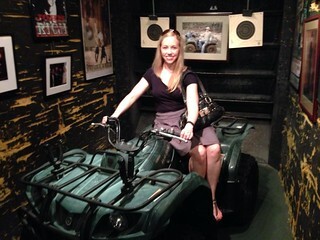 Afterward, we drove around downtown and went to see The War Room. Yep. We saw a movie we could have seen at home while we were on vacation. Ah friends it was so good and totally drives home the importance for prayer. Life is a battle and we truly so have to fight the good fight equipped with the word of God as our sword. Go see the movie and most importantly- find your personal prayer space and start talking to God! We treated ourselves to the Marble Slab after our movie and walked around the Opry grounds. We went back to the hotel, watched TV, and called it a night. I got another good nights sleep and woke later than I intended. I managed to workout and quickly get ready. Today started my favorite stretch of the trip! Before leaving Nashville we went back to the Opry Mills Mall and ate an early lunch at The Aquarium. I’d been there ages ago, but Will had never been. He was completely enthralled. It was adorable. We got there early and were able to watch the marine biologist feed the fish. It was so very neat! After our giant lunch, we drove a little outside of Nashville to Whites Creek, Tennessee. 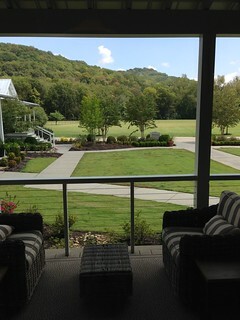 Will arranged a little surprise for us to stay at the beautiful Inn at Fontanel. It’s this tiny and beautiful bed and breakfast hotel on Barbara Mandrel’s former property. Not only that, but you can tour her house, and it’s still the largest log cabin house in the nation at over 30,000 square feet! I can’t even tell you how much I enjoyed every minute at this little bed and breakfast and all their little fun shops! 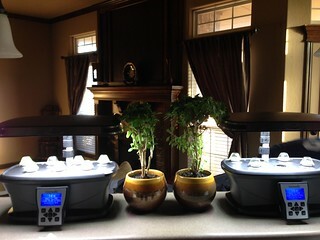 The staff was so nice and inviting and the whole atmosphere just screamed relaxation. Our little bunker had a welcoming little mini porch, and our room was just as cozy. After checking in we toured the grounds. We checked out the shop, the bistro, and the winery while waiting for our mansion tour to begin. The mansion was flat out spectacular. Afterward, we hung around the hotel grounds, got a snack at the bistro and ate outside, and then went back to our room to watch the NFL season opener while I did a little work. Oh- and we also experienced our first Goo Goo Clusters. Have you ever had one!? 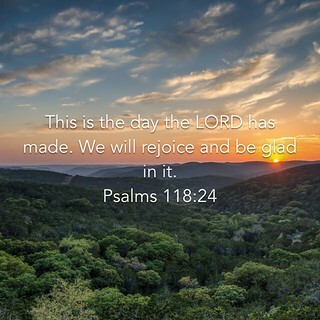 I was excited to rise early and enjoy the beauty of God’s glorious sunrise at the Fontanel. I intended to workout outside, and certainly made an attempt, but the Inn’s aggressive duck, Boomer, kept chasing me and made my outdoor workout impossible. I moved my workout into their gym area. Afterward I enjoyed my Bible study on our little patio. It was such a beautiful morning! We got ready and had breakfast in the main hotel area. Their continental breakfast was nothing like you typically think of when you think free breakfast. It was a delicious full meal. Afterward, we are we took an extra long walk around the Fontanel grounds and enjoyed the beautiful weather. I was sad to leave mid morning. I could have enjoyed another full day there. Such a relaxing bed and breakfast and definitely well worth the little detour on route to Knoxville. Speaking of Knoxville- that was the next stop on our trip! After the Christian music station went out we found a classic country station and I tested Will to see how much he knew. Before we knew it, we were in Oak Ridge, Tennessee and at our hotel! First order of business? Find some Tennessee barbecue. We headed into Knoxville to find Will burnt tips. He’s been talking about and wanting them forever. We’ve never been able to find them in Oklahoma, so when we made vacation plans, “burnt tips” was on the list. We ended up at Dead End BBQ for a mid afternoon lunch. It was packed and full of Vols. We enjoyed our lunch and the manager stopped by and talked football with us for awhile. Lots of fun. After dinner we hit up a Kroger for cookies (priorities) and called it a day. I got up early, worked out, and got around. Anytime we head out of town we look to see if there’s a Perkins in the area. That place always brings back good memories. Anytime we’d fly into Minneapolis from Kuwait to stay a couple days, we’d hit up a Perkins and devour their mammoth muffins and pie. We continued tradition in Knoxville, treating ourselves to a big breakfast...and peanut butter pie. We drove to the civic center to take their shuttle to the stadium. We were early, so we walked around and enjoyed the beautiful weather. Once we got to the stadium we walked around and enjoyed the scenery, even with all the orange. Their stadium is crazy steep, which always makes me a but nervous. It didn’t help when we watched an elderly man tumblr six rows from his seat! Horrifying. Thank God he was ok, and I was more than fine not moving a single bit after we got settled. The volunteer stadium is huge and seats over 100,000. 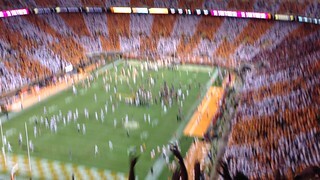 The Vols were excited and came loud! I still can’t get over how deafening it was. In fact, they broke a stadium sound record! They played hard. For almost the entire game I thought we were a goner. Somehow, someway, sooner magic made its way on the field and the boys tied it up and sent it to overtime. Talk about a nail biting victory! We intended to quickly leave and get back to our car. Only, no one tells you how long it takes to get out of the stadium, off the campus, and out of traffic. Think about a city of 100k all making a mass exodus from a small space. We left our stadium seats around 10:00 and didn’t even get back to our car from taking the shuttle until after midnight! Then we had to drive to our hotel. It was a long night and I’m sure glad we won! Vacation officially ended this day. We flew out of Knoxville, so thankfully no two hour road trip back to Nashville. Off and away we went. We left early and were back home before noon. Oh man we had such a wonderful vacation. It had been awhile since we’d taken a good trip like that, so we thoroughly enjoyed our getaway. So there you have it! I needed to get this all down for posterity’s sake. We always look back years later and reminisce about little details on these trips, so I try my best to capture it all while it’s still somewhat fresh. I thought it was a good time to check in with an update. What’s been going on? What have you been up to? Share! Share! The last month was busy, but good. I got my stitches out a few days after my last post. I continue to heal. 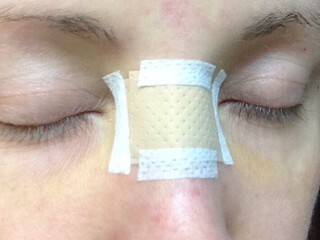 My nose is super red and will be for a few more months probably, but I’m thankful it’s all done and behind me. Moral of the story? Wear sunscreen! Chances are, lots of damage is already done from our younger years, and it’s all the more reason to take care of ourselves now! P and her beau set a date and are getting hitched in November. They went from planning a stressful and large soirée to a much quieter, simpler wedding. I love they went this route and will be honored to be among the small group of people they entrust with this sacred moment. As a side note, how is my sister old enough to be married!? I’m sure I’ll share all sorts of beautiful pictures, stories, and such in the coming months. 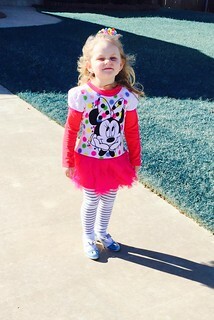 Oh and PS- Layla started preschool last week! 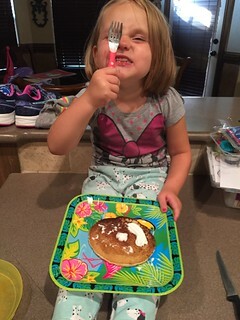 I can’t believe she’s already old enough to be going to preschool! Not gonna lie, I got misty eyed. Last Wednesday kicked off football season. It’s like an official holiday in our house. We flipped back and forth between games soaking up every tackle, touchdown, and catch. Our beloved Sooners took the field Saturday, and as usual, I nearly melted into a giant puddle from the intense heat. We had a fairly mild August, but just my luck, temps went back to normal as football season started. WHY DO YOU HATE ME!? Nonetheless I’m excited about a new year and fresh start. I’m not picking us to take it all, or probably even win the big 12, but I think we’ll be much improved a serious contender. Guys, God has blessed me so much with this boot camp bible study thing. I can’t even take it! I started out with just one person attending- ME. Just a couple weeks later I was up to two, then three, with two more committed for our next session. Considering we meet Saturday at the crack of dawn, I’m encouraged. I gave it totally to God when I started in July and continue to let Him do whatever he desires. Our workouts have been fantastic, the Christian playlists I’ve put together are ridiculous (in the best way possible), and our conversation has been blessed. God is good! I sure wish you gals could join us. For some strange reason, Will and I decided to stick in an old Frasier box set in while I was at home after surgery. Here we are a month later and are already nearly halfway done with season 2. I’m pretty sure it’s Will’s favorite show. It got us through lots of homesick nights in Kuwait. It’s been fun and I felt I ought to remember it on her blog. We visited Will’s parents last weekend along with my BIL and SIL. It was fun. 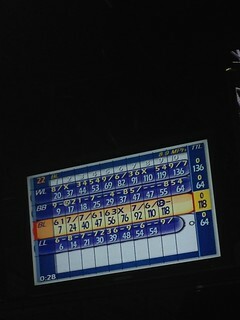 We went bowling and I broke my average 35ish range. As for other things, I did a mini balyage treatment on my hair last week. I wanted to go back to my natural color thinking it was going to be a fairly dark blonde. Turns out I was completely wrong! I’ve highlighted half my head for years and never really paid attention to the underneath color. It always looked dark to me because the highlights were always so light. 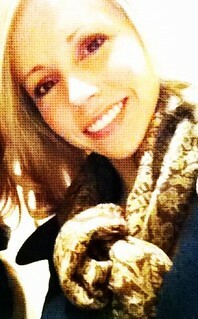 Anyway, turns out I’m naturally way blonder than I thought (an 8 on a scale of 10), which explains a lot. Such as why, upon realizing we were out of dish tablets, I put a tablespoon of ivory dish soap in the dishwasher, hit start, and let it run the entire cycle. Let’s just say there were bubbles everywhere. Or why I threw Lucy’s much needed medication in the trash not realizing there were still several days worth of medicine still in the packet. Resulting in a dumpster dive situation. So yeah, turns out I’m not blonder than I pay to be. I’m actually really that blonde. Ha! On a more serious note, I’m kind of unsure what to do with this space, guys. It’s old, dated, clunky and I have no idea how to fix any of it on my own. Not only that, but I kind of feel like this space is slightly schizophrenic. It’s worked well for a decade, housing all my silly stories and experiences as a 20 something newlywed. However, now I’m not so sure. I feel the few of you who still visit should be able to count on some sort of structured content each day, which I feel I’ve done a great job of keeping up with over the last few years. However I can’t help but feeling the Lord moving me in a different direction, which is one of the reasons I’ve been posting less frequently. I feel there’s so much pressure for everyone to have some sort of online presence, or following, or persona. I completely see the value of online media and have so enjoyed keeping up with my friends that way. However in this current season of life I’m prompted to pull back more. 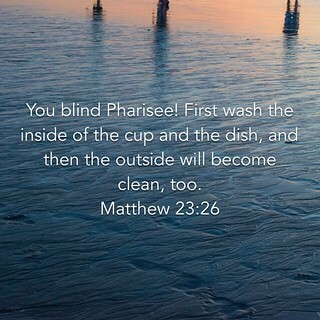 To take the focus off myself and to put it on Jesus. I’m struggling to find balance between posting what I had for lunch and sharing why I feel the Church needs to refocus our affections on our one true Love. I’m struggling because this blog was created by me, for me, and doesn’t feel like it belongs to Him. Sometimes it doesn’t feel right posting here anymore. So I’ve been sitting quietly. I’ve toyed with the idea of starting fresh and creating an entirely new space, but it feels daunting. I’ve thought about paying for a makeover of the current space, but I’m not sold on that either for the above reasons. So yeah, I have no idea what direction this little site is going. I find it important to chronicle some of our goings on, as I’ve valued being able to capture memories over the years, but I’m not sure this space is the right space to cover heavy topics on my heart right now. You’ve got my Wednesday workout right next to a post on eschatology. It seems a little incongruent. It took me over 30 years but I finally get that this life is so much more and so much better when it’s surrendered to Christ. That’s how our life should be, but somewhere between the garden of Eden and today we decided we could do things better on our own. I don’t want to do things on my own anymore. And He’s taking me up on the offer of my surrendered heart. It’s glorious, but sometimes it hurts a little too. I want to share so much of it with you, but right now I’m taking a step back to see what exactly that looks like. I had no intention of pouring this all before you, but since I’m on a roll I thought I better share. I’m not breaking up with my blog, but I do think there will be some changes. Perhaps I start a separate site with more frequent devotional type posts while still maintaining this old dinosaur for capturing updates and life stuff. Until then, look for update type posts like this one (minus the whole giant book I wrote about the blog 😃) and devotional type posts. So yeah. I think that’s my update. Thanks for stopping by! Hope you had a good extended weekend! Which is simultaneously comforting and terrifying. 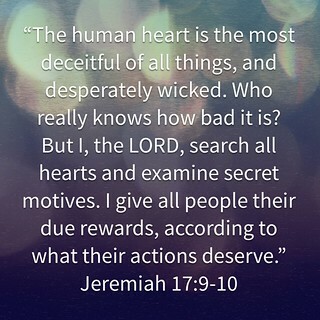 After all, we are reminded in Jeremiah that the heart is deceitful above all things, and the Lord searches and examines its depths. I’ve been thinking a lot about what God sees when He looks at my heart. Do I spend as much time on the inside of the cup as I do the outside? 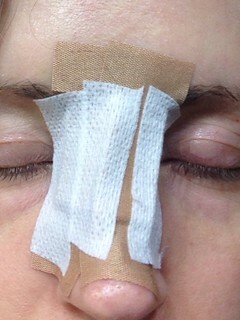 I had Mohs surgery on my face to remove some potentially cancerous cells this past Wednesday. I was a wreck the week after my pre-op and as I googled the surgery. 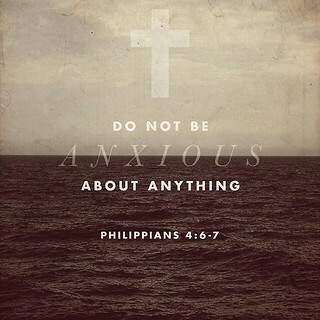 A word to the wise- don’t google worrisome things you’re facing in life. It’s pretty much a guarantee the most extreme cases or situations will be the first to come up in the search and will ruin you. 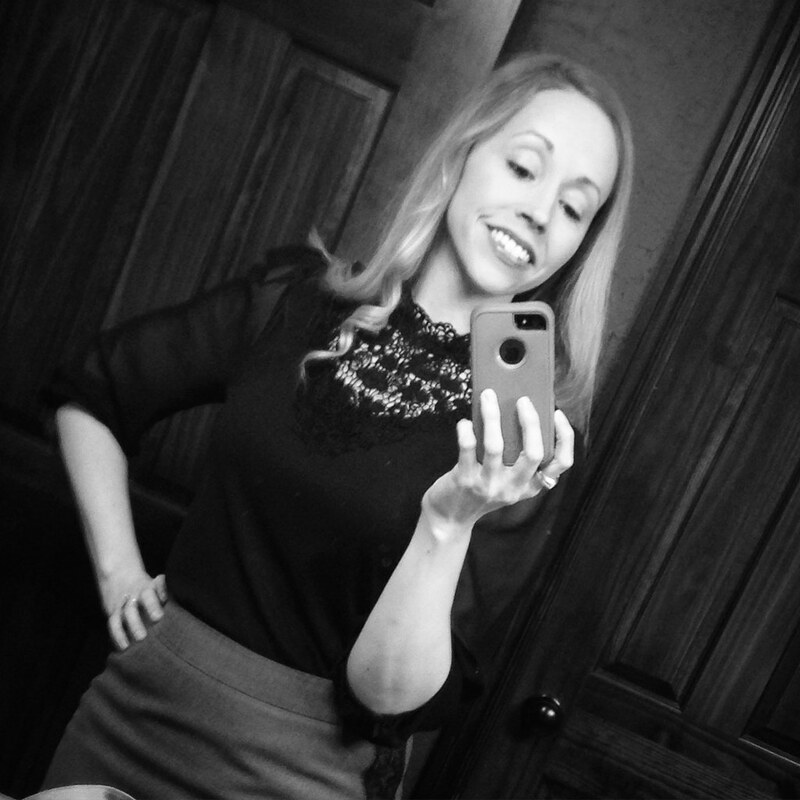 I was a wreck because I’m a woman in my 30s. While my best years are yet to be, let’s face it, I’m not shiny faced and 20 anymore. Makeup is a necessity these days and wrinkles continue to appear out of nowhere. And now I have to worry about basal cells so early!? The night after my pre-op (which was over two months before the surgery!) I googled and cried and googled and cried some more. This went on for about a week each evening. Will, dear Will, was no help. 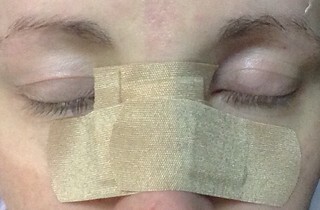 To him there was a problem (possible basal cells) and a solution (the removal of said cells). Yes, he’s right, but any woman knows there’s more that meets the eye. The worry of all the new spots they’ll probably find in the coming years (a result of my stupid decision to tan during my teens). 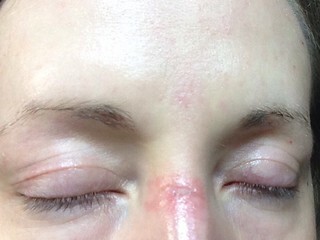 A giant scar on my face. One of my dear friends and prayer warriors completely got it. We cried together a lot that week and prayed even more. Her prayers were completely beautiful, true, and anointed. She reminded me of my value in Christ and that He bottles my tears and works for good no matter what. Her godly prayers strengthened me so very much and the holy spirit used them to bring such peace during the painfully long time between my pre-op and surgery. I had a of of time to think about my heart condition during the two months leading up to surgery. There’s so much gunk and yuckiness deep in the depths. Not only was I going to battle surgery and a scar on the outside, but I also needed some heart surgery on the inside too. I’d like to tell you the inside surgery has been easier than the outside surgery, but I’d be lying. It hurts to surrender to Christ. Not because of Him- His burden is light. But because of my own sinful nature and desire to rule myself and pursue my own desires. Just as the doctor stripped away a layer of the bad cells on my nose Wednesday, the Lord has begun to strip away my own internal heart cancer layer by layer. Pride, worry, spitefulness… The list goes on and on. I can’t hide the scar on my face, it will always be there. I also can’t hide my hurts before the Lord, He searches the depth of my heart and sears my soul with the promise He is ever present. Just as my doctor took care to stitch me back together, the Great Physician, my Jehovah Rapha, heals my heart. He prunes away the things that dishonor Him, and fills me with more of His goodness. My scar will take time to heal and will leave a daily reminder of what transpired. In the same way, my heart certainly also bears the scars of a heart broken by my own sinfulness and horrid decisions, only to be stitched together and healed by a God big enough to restore even the biggest of messes. 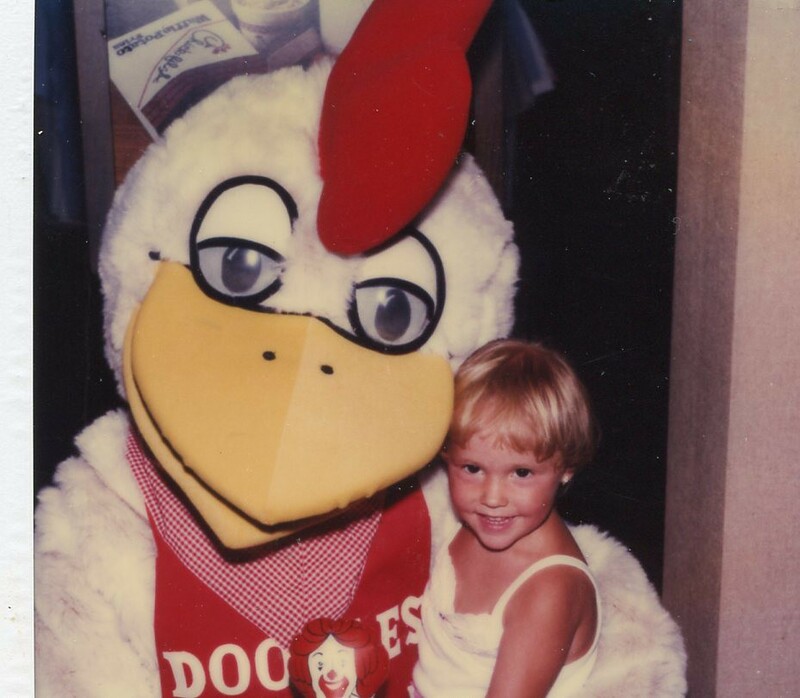 I’m not happy I had to go through this experience, but I am thankful for the reminder of where I’ve been, where I am, and where I’m heading as I pursue Christ. On a much lighter note, I’ve taken several days off to recover and have not done a single thing. It’s been the most uneventful and lazy few days of my entire life. Will and I are surprisingly really good at being completely worthless. I’ve only gone out to see my mom a couple times (my sister and Layla stopped by too!). I also went through a drive through twice, but that’s it. At this point I was having a complete meltdown. Thankfully Will went to the drawing board and engineered attempt number three, which was much improved over the previous two. 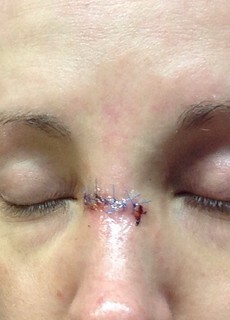 I get my stitches out Wednesday and am so ready! Thankfully attempt three made me feel slightly less garish. I’m sure Will would agree- this staycation has been incredibly dull, but it’s still been nice to be together and heal up. So there you have it, not only a devo but also a real life update. I’m writing this letter as a much older version of who you are today. I have to use my imagination a bit and ask for wisdom because, let’s face it, you’re a bit of a mess sometimes. I had to weed through all your quirkiness to imagine you a good 20 years from now. Here’s to hoping I’m spot on. Heck, I’ll consider it good if I’m even half right with this future version of Brittny. Ha! Joking aside, do you remember the sermon you listened to last week? It was about time and just how fleeting it is. I can attest, as I’m in my 50s now, just how quickly it passes. Birthdays, Christmases, life and death. The days, weeks, and months melded together and before I knew it, I woke up and was 52 years old. My face is wrinkled and my hands are spotted from the sun. I even bought a pair of old lady pants last week. Lord help us! I tell you all this because, I’m 52, Brittny. I look at you today and sure wish you would ease up on yourself. You stress far too much about things that don’t matter. You know better, but you do it anyway. You’re anxious over the silliest things and let them squish you into a big stress ball. You work too hard at things that will not matter, and not enough at the things that will matter. Yes, work is important, but as I’m 52 and seen a few things that you haven’t, I assure you that agreement you’re working can wait until tomorrow. Be less of a Martha and more of a Mary. They’re both important in their own right, I know, but you worry far more over things of such little value in the grand scheme of life. Let a little dust collect on the baseboards every now and then if it means more time serving Jesus and your family. Those are things that count. Sleep more and worry less. You’re not too busy for friends like you think you are. They’re worth it. Invest time in them, you won’t regret it. Keep praying that God will give you the desires of your heart. I know you’re at a desk job pushing paper thinking it will never amount to anything, but keep praying and keep trusting. The days go so fast, Brittny. So very very fast. Stop putting your head down and powering through just to make it to the end of the work day. Look up, look around, enjoy the day I’ve given you. It’s the only day you get. July 31, 2015 is the only July 31, 2015 you’ll ever ever have. Remember that and live like it. Put God first and don’t worry about the rest. People will say you’re extreme. Love them and take it as a compliment. Don’t be afraid to sing loudly, eat cake without feeling guilty, and tell Will daily how much you care- even when he gets annoyed by your gushiness. Give more money to the causes you want, and don’t be afraid to say yes or no to opportunities. I don’t want you to have any more regrets about things you wish you could do or things you should have done. Know God and surrender to Him daily. Love others without fear or expecting anything in return. That’s the biggest advice I want to give you today. Lighten up. Your life is but a breath. Remember how short it is, and go easy on yourself. It’s such a gift and goes so quickly. I sure hope this letter touches your heart today. Please take it seriously and read these words from time to time. Trust me, the older version of yourself knows you’ll need the reminder. There’s so much more advice I could offer (like stop wearing that ugly green shirt you like so much! ), but I think this is more than enough. Chin up, sweet girl. You turn out just fine.